Adoptive cell transfer (ACT) is a promising cancer immunotherapeutic strategy that remains ineffective for a large subset of patients. ACT with memory CD8+ T cells (Tmem) has been shown to have superior efficacy compared to traditional ACT with effector CD8+ T cells (Teff). Teff and Tmem have complementary physiological advantages for immunotherapy, but previous publications have not examined ACT using a combination of Teff and Tmem. Splenocytes harvested from Ly5.1+/C57BL/6 mice during and after infection with lymphocytic choriomeningitis virus (LCMV) were used to generate bona fide effector and memory CD8+ T cells specific for the LCMV epitope peptide GP33. Congenic Ly5.2+/C57BL/6 mice were inoculated with B16F10 melanoma cells transfected to express very low levels of GP33, then treated with ACT 7 days later with GP33-specific Teff, Tmem, or a combination of Teff + Tmem. Inhibition of melanoma growth was strongest in mice receiving combinatorial ACT. Although combinatorial ACT and memory ACT resulted in maximal intratumoral infiltration of CD8+ T cells, combinatorial ACT induced stronger infiltration of endogenous CD8+ T cells than Tmem ACT and a stronger systemic T cell responsiveness to tumor antigen. In vitro assays revealed rapid but transient melanoma inhibition with Teff and gradual but prolonged melanoma inhibition with Tmem; the addition of Tmem enhanced the ability of Teff to inhibit melanoma in a manner that could be reproduced using conditioned media from activated Tmem and blocked by the addition of anti-IL-2 blocking antibody. These findings suggest that a novel combinatorial approach that takes advantage of the unique and complementary strengths of tumor-specific Teff and Tmem may be a way to optimize the efficacy of adoptive immunotherapy. Adoptive cell transfer (ACT) is a promising strategy for cancer immunotherapy that involves the isolation, expansion, and infusion of tumor-specific CD8+ T cells. When combined with interleukin-2 (IL-2) and lymphodepletion, ACT has led to complete and durable tumor regression in up to 20% of patients with metastatic melanoma . Despite this, ACT remains ineffective for a large subset of patients. Traditionally, ACT involves the use of terminally differentiated CD8+ effector T cells (Teff) collected from tumor-infiltrating lymphocytes (TILs). When naïve T cells encounter antigen, they clonally expand and differentiate into Teff that have the ability to rapidly clear cells expressing their cognate antigen [2, 3]. Following antigen clearance, the majority of Teff then undergo apoptosis, while a small population of antigen-specific CD8+ memory T cells (Tmem) persists long-term and can rapidly proliferate upon antigen re-exposure [2, 3]. The use of different T cell subsets is one potential way to improve the efficacy of ACT. Less-differentiated effector cells have been shown to have superior antitumor immunity compared to terminally-differentiated cells, potentially due to a number of mechanisms such as decreased IL-2 production and increased apoptosis with further differentiation [4, 5]. Our laboratory and others have also demonstrated that ACT with Tmem is more effective than ACT with Teff or naïve T cells [6, 7]. Tmem appear to be uniquely resistant to melanoma-induced suppression and generate a stronger intratumoral immune response [7, 8]. No previous publications have explored performing ACT with a combination of Tmem and Teff. Although Teff are prone to apoptosis, we hypothesized that this limitation could be offset by the innate proliferative ability of Tmem, with Teff contributing to initial tumor control and Tmem to later tumor control. In a murine model, we compared the efficacy of ACT using bona fide Teff, Tmem, and a combination of both. We utilized a novel melanoma tumor expressing very low levels of a viral peptide in order to dissect the biological effects of peptide-specific CD8+ T cells of true effector and memory differentiation. This methodology enables us to examine the therapeutic implications of bona fide effector and memory tumor-specific CD8+ T cells in a manner not possible with standard murine melanoma targets like GP100. Using in vitro experiments, we explored the temporal cell killing patterns and paracrine effects of these T cell subsets. We discovered that the combination of Teff + Tmem led to the strongest control of melanoma tumor growth, potentially due to complementary cell killing patterns and local production of IL-2 by Tmem. Seven- to eight-week old female congenic C57BL/6 mice with allele Ly5.1+ (T cell donor mice) or allele Ly5.2+ (T cell recipient mice) were purchased from Taconic (Hudson, NY) and maintained in sterile housing. All mouse work was reviewed and approved by the University of Wisconsin and William S. Middleton Memorial VA Hospital and VA Ann Arbor Healthcare Animal Care and Use Committees. Viral infections and tumor inoculations were performed per our previously published protocols [7, 9, 10]. In brief, Ly5.1+/C57BL/6 mice were infected with 2 × 105 PFU of Armstrong strain lymphocytic choriomeningitis virus (LCMV; gift from Marulasiddappa Suresh, University of Wisconsin) via intraperitoneal injection to generate CD8+ T cells specific for GP33, a class I MHC-restricted LCMV surface glycoprotein. Splenocytes were harvested 8 days after infection (at which time LCMV peptide-specific CD8+ T cells are of effector differentiation) to obtain bona fide Teff (as evidenced by CD127low/KLRG1high expression) and 50–80 days after infection (at which time LCMV peptide-specific CD8+ T cells are of memory differentiation) to obtain bona fide Tmem (as evidenced by CD127high/KLRG1low expression) [7, 8]. 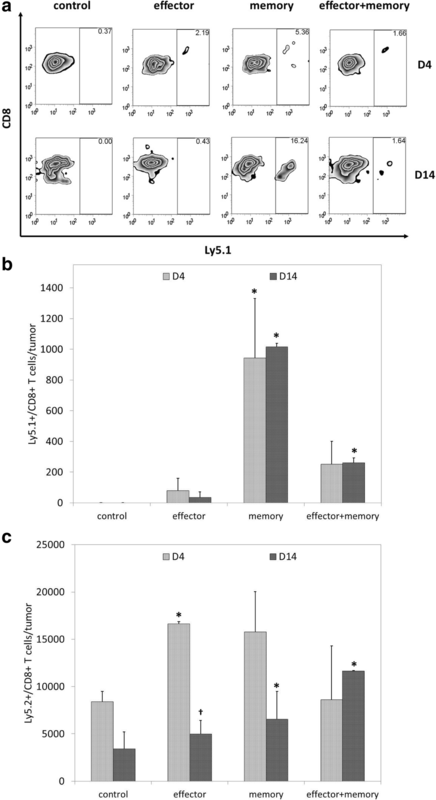 The yield of GP33-specific memory CD8+ T cells was increased by adoptively transferring Ly5.1+/C57BL/6 mice with 103 Ly5.1+/CD8+ T cells derived from splenocytes of Ly5.1+/P14 TCR transgenic mice (C57BL/6 background mice with CD8+ T cell specificity for GP33 . The spontaneous mouse melanoma cell line B16F10 was transfected with a plasmid encoding GP33, and poorly immunogenic clones with low levels of GP33 expression were selected to create a new B16GP33 cell line, which we have previously demonstrated to be of comparably low immunogenicity as parental B16F10 [9, 10]. This line was cultured in RPMI-1640 medium (Mediatech, Herndon, VA) with 10% fetal bovine serum, 2 mM L-glutamine, 100 μg/mL streptomycin, and 100 U/mL penicillin (Life Technologies, Inc., Grand Island, NY). Ly5.2+/C57BL/6 mice received subcutaneous injections of 1 × 106 B16GP33 cells suspended in serum-free RPMI-1640 to generate flank melanoma tumors. Adoptive cell transfer was performed per our previously published protocol [7, 8, 10]. As previously observed, GP33-specific CD8+ T cells typically comprised approximately 8–10% of splenocytes harvested from effector and memory T cell donor mice [7, 8]. After obtaining splenocytes from mice infected with LCMV, magnetic bead separation columns (Miltenyi, Auburn, CA) were used to isolate CD8+ T cells. Flow cytometry was performed to quantify the percentage of tumor-specific GP33-specific CD8+ T cells. 105 GP33-specific CD8+ Teff, Tmem, or 5 × 104 Teff + 5 × 104 Tmem were adoptively transferred via retro-orbital intravenous injections into B16F10- or B16GP33 melanoma-bearing mice at specific time points after tumor inoculation. For multiple timepoints, a total number of 2 × 104 GP33-specific CD8+ Teff and Tmem or both were separately co-cultured with 2 × 104 B16GP33 melanoma cells at an overall effector:target ratio of 1:1 in 48-well plates in the presence of 10 ng/mL recombinant human IL-2 (BD Biosciences, San Jose, CA) for MTT assays as previously described . T cells were characterized and isolated using the methodology described for adoptive cell transfer. Viable B16GP33 melanoma cells were quantified using the Celltiter 96 non-radioactive MTT assay kit (Promega, Madison, WI) following the manufacturer’s instructions. For 5 h, GP33-specific CD8+ Teff and Tmem were cultured separately or together in RPMI-1640 with 10 ng/mL IL-2 and 0.1 μg/mL GP33 peptide (gift from Marulasiddappa Suresh, University of Wisconsin). Conditioned media was collected by centrifuging wells and collecting the supernatant. For 12 h, GP33-specific CD8+ Teff and Tmem were then co-cultured with B16GP33 melanoma cells with or without conditioned media and anti-IL-2 (BD Biosciences, San Jose, CA) for MTT assays as described above. Flow cytometric analysis was performed per our previously published protocol [7–10]. Once harvested, tumor samples were processed into single-cell suspensions with mechanical fractionation on a fine wire mesh followed by lymphocyte isolation using Histopaque (Sigma Aldrich, St. Louis, MO). Splenocytes before ACT and tumor-infiltrating lymphocytes (TIL) 4 to 14 days after ACT were stained with APC-labeled MHC class I tetramers loaded with GP33 peptide (NIH Tetramer Facility Core, Atlanta, GA), PerCP-labeled anti-CD8 mAb, PE-labeled anti-Ly5.1 mAb, and FITC-labeled anti-CD44 mAb (BD Biosciences, San Jose, CA). Intracellular staining required stimulation of lymphocytes with media alone or with GP33 peptide (1 μg/mL), brefeldin A, and recombinant human IL-2 (10 ng/mL) at 37°C for 5 h. A BD LSRFortessa flow cytometer (BD Biosciences, San Jose, CA) was used and data were analyzed using FlowJo software (Tree Star Inc., Ashland, OR). Experimental data was analyzed using IBM SPSS statistical software version 23 (Armonk, NY). T-test was used to compare groups and a repeated-measures analysis of variance (ANOVA) with pair-wise comparisons performed using Fisher’s protected least significant difference tests were used to compare multiple groups. Significance was defined as p < 0.05, and error bars represent standard errors of the mean. To verify the peptide specificity of our ACT model, C57BL/6 mice were treated with 105 GP33-specific Teff one day after subcutaneous inoculation with B16GP33 melanoma or parental B16F10 melanoma (which does not express GP33). As shown in Fig. 1a-b, early ACT strongly suppressed the growth of B16GP33 melanoma but not B16F10 melanoma, suggesting that the effect of ACT was peptide-specific. Moreover, the kinetics of B16GP33 tumor growth in immunocompetent mice was comparable to those of parental B16F10 tumor. To compare the efficacy of ACT with different T cell subsets, Ly5.2+/C57BL/6 mice received ACT of 105 GP33-specific CD8+ Teff, Tmem, or Teff + Tmem on day 7 after subcutaneous inoculation with 106 B16GP33 cells. As shown in Fig. 1c-d, memory ACT resulted in significantly greater inhibition of tumor growth compared to effector ACT as previously described.7 Combinatorial ACT with Teff + Tmem had significantly greater inhibition of tumor growth compared to ACT with Teff or Tmem separately, making this combination the most effective strategy for ACT. 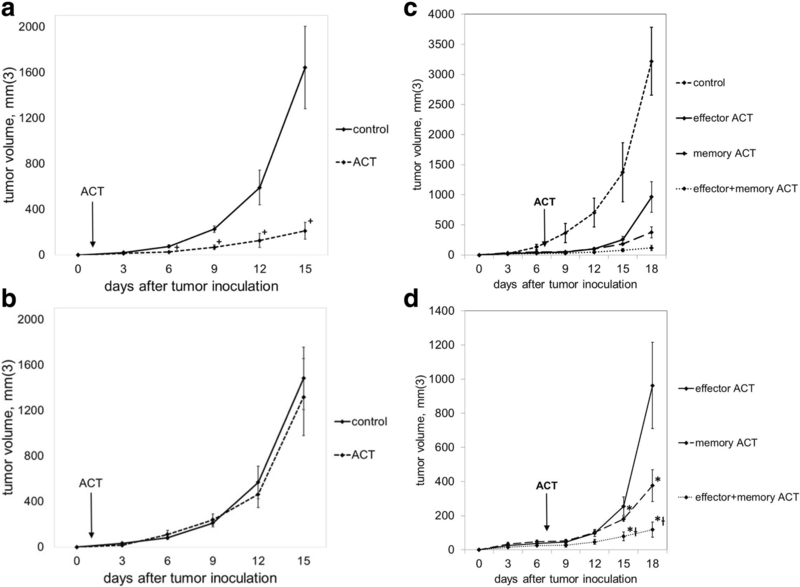 To determine if the efficacy of combinatorial ACT was associated with stronger intratumoral T cell infiltration, mice were euthanized 4 and 14 days after ACT to allow for tumor harvesting and flow cytometric analysis of TIL populations. Representative data shown in Fig. 2a demonstrate that CD8+ T cells comprised a higher percentage of TIL in mice treated with ACT in comparison with untreated controls. As shown in Fig. 2b, total numbers of intratumoral CD8+ were transiently elevated on day 4 in mice treated with effector ACT, but this effect was short-lived; in contrast, intratumoral CD8+ T cells remain elevated on day 14 in mice treated with memory and combinatorial ACT. 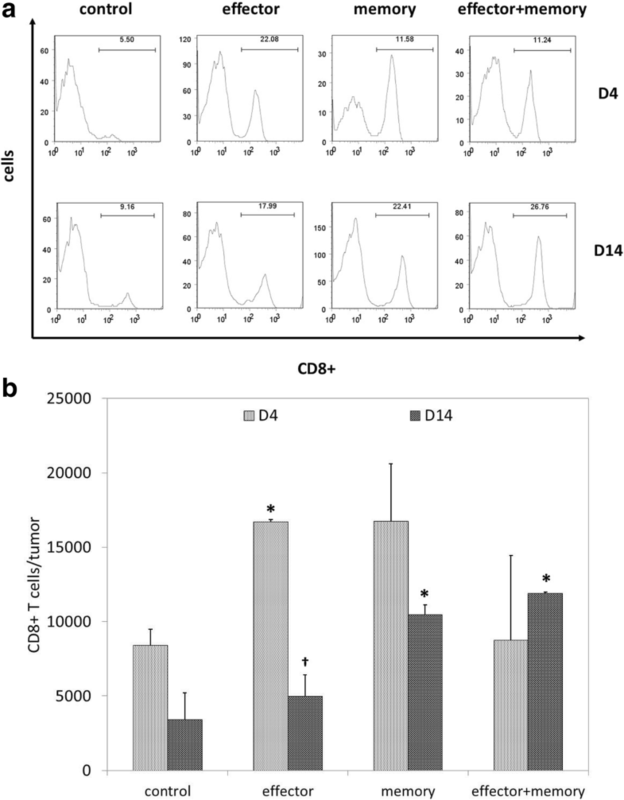 To characterize the increase in intratumoral CD8+ T cell infiltration seen following ACT, flow cytometric analysis was used to quantify the presence of Ly5.1+ adoptively transferred CD8+ T cells and Ly5.2+ endogenous CD8+ T cells. Representative flow cytometric data are shown as percentages in Fig. 3a; overall data are shown as total cell numbers in Fig. 3b-c. As shown in Fig. 3b, Ly5.1+ adoptively transferred CD8+ T cells comprised a small and short-lived fraction of TIL after effector ACT but were present in substantial and stable numbers after memory ACT; combinatorial ACT, which used half the number of Tmem used in memory ACT, resulted in smaller numbers of intratumoral Ly5.1+/CD8+ TIL. In contrast, as shown in Fig. 3c, combinatorial ACT resulted in the strongest intratumoral infiltration of endogenous CD8+ T cells. To determine if combinatorial ACT improved systemic antitumor responsiveness in addition to local antitumor activity, splenocytes harvested 14 days after ACT were stimulated with or without GP33 peptide in the presence of IL-2 and brefeldin A, and stained to assess intracellular levels of IFNγ expression. Representative flow cytometric data are shown as percentages in Fig. 4a; overall data are shown as total cell numbers in Fig. 4b. As shown in Fig. 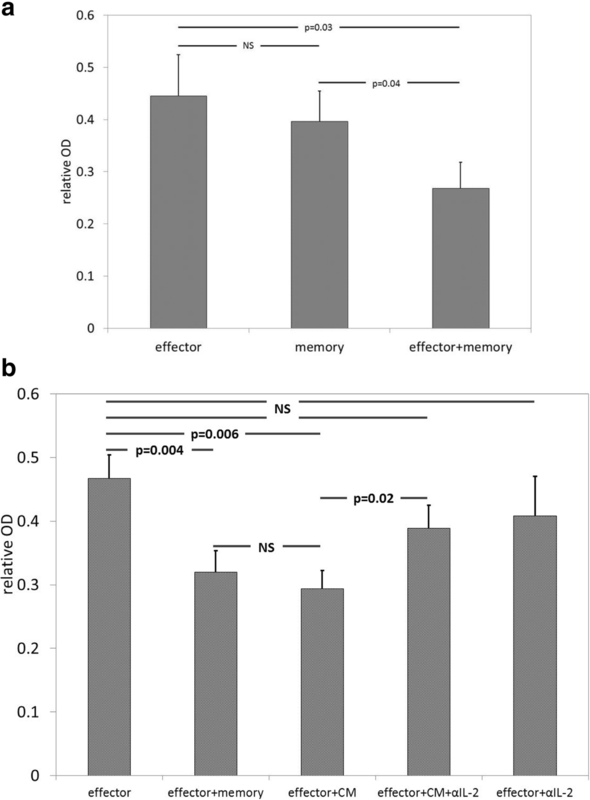 4b, memory ACT resulted in stronger splenocyte reactivity to GP33 than effector ACT, as we have previously described.7 However, combinatorial ACT produced significantly greater IFNγ expression among splenocytes than memory ACT, suggesting that combinatorial ACT may induce a much stronger level of CD8+ T cell responsiveness to tumor antigen. To further explore the improved efficacy of combinatorial ACT, Teff and Tmem were co-cultured in vitro with B16GP33 melanoma cells in the presence of IL-2 for 72 h. As shown in Fig. 5, serial MTT assays demonstrated that Teff inhibited melanoma more potently than Tmem at 6 h. However, whereas the ability of Teff to inhibit melanoma was lost at later timepoints, Tmem continued to inhibit melanoma for the duration of time points tested (up to 72 h), suggesting that the enhanced therapeutic efficacy of combinatorial ACT could be due to the temporal combination of early melanoma inhibition mediated by Teff plus delayed but durable melanoma inhibition mediated by Tmem. To determine if the improved efficacy of combinatorial ACT was attributable to local interactions between cell types, Teff, Tmem, and Teff + Tmem were co-cultured with B16GP33 cells in the presence of IL-2 for 8 h. As shown in Fig. 6a, whereas Teff and Tmem resulted in comparable levels of melanoma inhibition at this time point, the combination of Teff + Tmem resulted in a stronger level of melanoma inhibition. To determine if this enhancement was attributable to paracrine effects, Teff and Tmem were separately stimulated with GP33 peptide for 5 h, after which cells were pelleted by centrifugation and conditioned media were collected. As shown in Fig. 6b, the addition of conditioned media from Tmem enhanced the ability of Teff to inhibit melanoma to a comparable level seen with Teff + Tmem. The addition of conditioned media from Teff did not enhance the ability of Tmem to inhibit melanoma (data not shown). When anti-IL-2 blocking antibody was added to conditioned media from Tmem, this effect was lost, suggesting that paracrine release of IL-2 from Tmem may potentiate tumor cell death caused by Teff. The addition of anti-IL-2 blocking antibody alone did not affect the ability of Teff to inhibit melanoma. For the first time, we have shown that ACT using a combination of Teff + Tmem leads to even more robust control of melanoma growth than ACT using Teff or Tmem alone. Our findings suggest that the advantage of combinatorial ACT may result from the induction of stronger infiltration of endogenous CD8+ T cells into tumor, stronger systemic CD8+ T cell responsiveness to tumor antigen, temporal differences in melanoma cell killing, and paracrine IL-2 effects. One recent publication addressed the effects of combining T cell subsets prior to ACT, but this involved co-culturing naïve cells with Tmem for 6 days prior to ACT . That approach led to a loss of less-differentiated T cell subsets and impaired in vivo tumor regression . By combining Teff + Tmem at the time of adoptive transfer, we were able to retain the innate advantages of each T cell subset. We observed that combinatorial ACT generated stronger intratumoral CD8+ T cell infiltration than ACT with Teff or Tmem alone; this was not due to greater trafficking of adoptively transferred cells into tumor, but a result of more potent induction of endogenous immune responses. This stimulation of ongoing endogenous CD8+ T cell responses may contribute to the heightened efficacy of combinatorial ACT compared to memory ACT. We previously found that combining ACT with checkpoint inhibition led to a similar induction of endogenous TILs that was also associated with greater tumor suppression, stronger systemic T cell responsiveness to tumor antigen, and a more potent long-term anti-tumor immunity . Enhanced melanoma cell death resulting from combinatorial ACT may promote stronger local cytokine/chemokine release, antigen presentation, and priming of endogenous tumor-specific T cells , ultimately promoting stronger systemic anti-tumor immunity. Given the innate predisposition of effector cells to rapidly target antigen, and the ability of memory cells to persist and expand, we hypothesized that the ability of Teff and Tmem to engage and inhibit melanoma would exhibit temporal differences. Indeed, in vitro assays demonstrated that Teff cause immediate but transient melanoma inhibition, while Tmem cause gradual but persistent inhibition. This pattern is further reflected by the fact that, whereas ACT with Teff resulted in a decline in intratumoral adoptively transferred Ly5.1+/CD8+ T cells at 14 days, ACT with Tmem resulted in stable numbers of intratumoral transferred T cells. Thus, the activity of effector and memory cells may be complementary over time, leading to stronger and more prolonged melanoma suppression. We found that the intrinsic ability of Teff to inhibit melanoma may also be enhanced by local production of IL-2 by Tmem. Unlike effector Teff, Tmem are uniquely capable of elaborating IL-2 in response to antigen stimulation [2, 3]. IL-2 supplementation has long been associated with improved outcomes following ACT . Systemic and local delivery of IL-2 in combination with ACT has been shown to increase CD8+ tumor infiltration and suppression of tumor growth [1, 14–17]. With combinatorial ACT, the local, paracrine production of IL-2 by Tmem may mitigate the need for exogenous IL-2 administration, decreasing the risk of systemic inflammatory side effects. By utilizing a melanoma expressing low levels of a viral peptide, we are able to examine the therapeutic effects of bona fide effector and memory differentiation tumor-specific CD8+ T cells in ways not permissible with the use of traditional tumor antigens (e.g., GP100). Although our B16GP33 tumor model does not appear to be more intrinsically immunogenic than parental B16F10 melanoma) , further work will be necessary to validate our observations using effector and memory CD8+ T cells directed against naturally occurring melanoma antigens. Our observations suggest that a combinatorial approach to ACT using both Teff and Tmem may be a means to optimize the efficacy of adoptive melanoma immunotherapy. While Teff can be readily expanded from TIL cultured in IL-2, it is difficult to prepare large quantities of Tmem. There is a growing body of literature characterizing the metabolic determinants of effector versus memory CD8+ T cell differentiation, suggesting that it may become feasible to develop this combinatorial approach for clinical evaluation [18–25]. This is an area of ongoing investigation in our laboratory. Traditional approaches to adoptive immunotherapy have used effector CD8+ T cells for their rapid proliferative capacity and ability to engage and clear tumor cells. Experimental evidence suggests that memory CD8+ T cells may have physiological advantages over effector CD8+ T cells. Our observations indicate that a combinatorial approach to adoptive immunotherapy using effector and memory CD8+ T cells concurrently results in superior tumor control associated with maximal induction of endogenous T cell responses to tumor. This strategy appears to take advantage of complementary differences in temporal killing of tumor cells by effector and memory CD8+ T cells, as well as local paracrine potentiation of effector CD8+ T cell function by memory T cell-secreted IL-2. These findings suggest that combinatorial approaches to cell-based immunotherapy harnessing diverse states of T cell differentiation may open the door to even greater therapeutic benefit. This work was supported by grant support from the Department of Veterans Affairs CDA-2 and Merit Review Award (1I01BX001619-01A1) to CSC, National Institutes of Health T32 (CA090217) to MVB, National Institutes of Health T32 (GM081061 and AI55397) to AC, and National Institutes of Health AI48785 to MS. The content is solely the responsibility of the authors and does not represent the views of the Department of Veterans Affairs or the United States Government or the National Institutes of Health. AC and MVB performed the mouse and lymphocyte experiments and analyzed and interpreted the data and contributed equally to the writing of this manuscript. AJT, SS and PS performed the mouse and lymphocytes experiments. MS interpreted the data. TKL performed the co-culture experiments and contributed to the writing of this manuscript. CSC analyzed and interpreted the data and contributed to the writing of this manuscript. All authors read and approved the final manuscript. All mouse work was reviewed and approved by the University of Wisconsin and William S. Middleton Memorial VA Hospital and VA Ann Arbor Healthcare Animal Care and Use Committees.